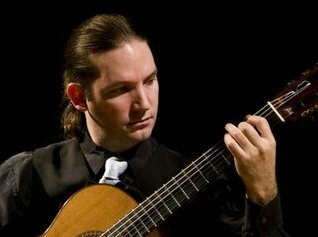 Marco Tamayo was born in La Havana, Cuba where he started playing the guitar at the age of three with his father. He studied with Antonio Alberto Rodríguez and Leo Brouwer, Harold Gramatges, and later in Europe at the University of Music in Munich (Germany, class of J. Clerch), and at the Mozarteum University of Arts in Salzburg where he studied with Eliot Fisk (guitar), Rainer Schmid (violinist), and Anthony Spiri (cembalist), Kenneth Gilbert (cembalist), among others. When he made his first public appearance at the age of six national TV channels in Cuba presented him as a prodigy young talent of the guitar. At the age of ten he was already touring former DDR and Bulgaria with his brother. Int.Guitar Competition Blas Sánchez (Canary Islands, Spain),1st Prize at the Int.Guitar Comp.in La Havana and 1st Prize at the Guitar Comp. “Villa de la Olleria”,Spain,in Duo (Chamber Music modality). He collaborated with important orchestras and chamber ensembles like the Philarmonic of Torino under the baton of Paolo Ferrara, the Chamber Orchestra of Aix en Provence (France), under the baton of Philip Bender, the Philharmonic of Tampere (Finland), the Philharmonic of La Habana under the Baton of Leo Brouwer, the TransArt Orchestra of Salzburg conducted by Kurt Redel, the Chamber Orchestra of St. Petersburg, and performing in Aix en Provence, France, and many others. Tamayo's official debut took place at the Chopin-Pleyel hall in Paris, in 1999. In March 2000 he embarked on his first Italian concert tour, giving ten concerts in the region of Piedmont, in Milan, Turin, Alessandria, Piacenza, and elsewhere. After the tour, the national Italian newspapers “La Stampa” called him: Il Re della Chitarra. (The King of the guitar). His concert activities shares with teaching and leading Master classes in different Guitar Festivals around the globe, Greece, Spain, Germany, México, Poland, France, Hungary, and in Universities like the Seoul University of Arts in South Korea. He lives in Klagenfurt (Austria) since 2005 and teaches as Professor at the Landeskonservatorium. He is appointed professor of guitar also at the University of Arts and Music “Mozarteum” since the year 1995 in Salzburg, in Sydney Australia and recenly in Gdansk (Poland).His classes include a large number of winners of Major International Guitar Competitions. In 2001, Marco Tamayo performed the "Concerto Madrigal", by Joaquin Rodrigo, together with Eliot Fisk, in Alessandria/ Italy and the Philharmonic of Turin conducted by Paolo Ferrara. Tamayo's recordings includes one Album for the Voice of Lyrics label in France, and three albums for the Naxos Classical Label. The Naxos release of “Cuban Music” by Marco Tamayo came out in February 2004, and the collection of Giuliani’s works in 2005 ,the entire Niccolo Paganini album including three Capricci original for violin solo, the Grand Sonata in A-Major, and some original works for guitar was released in 2006. On December 14th 2006 Marco Tamayo received the “Cittadinanza Onoraria”, Honourable Citizen of the city of Alessandria , in Piedmont , Italy , and is the second guitarist, after Maestro Alirio Díaz, who received this honor. In December 2013 received the same honor from Solero City, where the famous lute maker Pietro Gallinotti was born. Marco Tamayo was charged as Artistic Director on 28/12/2011 during the annual meeting of the Pittaluga Executive Board and since last 10 January 2015 he is "Committee advisor" too. "Marco Tamayo accetta la Direzione Artistica ribadendo la sua volontà di rinunciare al compenso (fatto salvo eventuali retribuzioni come artista/esecutore)".